Check out our new schedule of workshops and request a scholarship today! Our ninth annual after school art program begins this fall on Wednesday, September 6, 2017. Scholarships are available to any student, grades four and up, in the Clayton Ridge school district and in area homeschool programs. For nearly a decade, we have given away scholarships to every student who attends the program - and this is a tradition we will continue. This year we will once again be offering one and two-day workshops taught by local artists, with new course content like leather stamping, pouring paint, arm knitting, ink wash, baking and cooking classes from around the world, and more! Click here to view a schedule and download the scholarship form. Scholarship recipients must be in 4th grade or above in the Clayton Ridge School District. Homeschooled children are welcome! Scholarships applications are accepted on a rolling basis. After school art program hours are Wednesday, 3:30 – 5:00 p.m. Fridays from 2-3:30 are drop-in days for kids signed up for the month. We follow the school schedule: If they're cancelled or dismissing early for weather, we will not hold the After School Art Program. Healthy snacks will be provided by a grant from the Dustin Eglseder Memorial Endowment. Students may participate in glass cutting and firing, kiln firing, use of soldering irons, glazing, and other activities. Please dress accordingly. Doors close promptly at 5:00 p.m. Please retrieve your child by that time. Guttenberg Gallery and Creativity Center is not responsible for students' whereabouts after 5 p.m. Many courses have waiting lists. Remember that when your student signs up for a class, we purchase supplies and hire a teacher for that class – so please make sure your child is committed to attending. Slots cannot be held in future classes for students with two unexcused absences. Over 150 scholarships to this program have been made possible by grants, volunteerism, and donors since the program's inception in 2008. 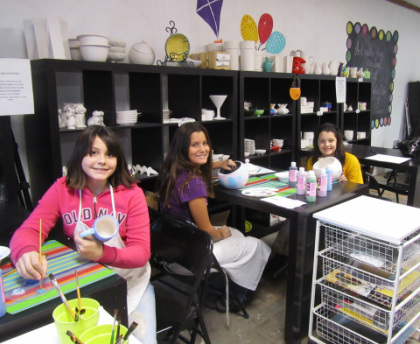 Students are guided by trained artists, staff, and volunteers. Our mission is to provide opportunities to learn about and participate in the arts. We foster group affiliation and acceptance and creative self-expression in a safe, structured and nurturing environment.